Saturday June 28th, 2014. A HOT, HARD WORK Day. Temperature: 104 in the shade, probably 115 on the runway. Comment: Hot, tiring day for most of the members who worked on the tumbleweeds. Tow pilot: Dan Gudgel most of the tows, Harold Gallagher three later in the day. WOW! The members really turned out today and worked in blisteringly hot heat. I'm convinced it was at least 115 degrees out on the runway where they were all working to rid the ground of the troublesome tumbleweeds. That so many came and simply worked all day is a testament to the dedication of our members to a great soaring site and cooperation among all. Ethen Ronat, the organizer of the work crew, works hard himself. Karl Kunz flew down from Monterey just to help out with the weeds. Pancho loaned the crew his truck for carrying away the weeds. That's Joe A. loading. I would like to deeply thank a bunch of hard workers, who joined forces and did a great job clearing nearly all of the two main runways. This job was much bigger than I anticipated, and it took 12 of us more than 4 hours, and still the job is not completely done. Some of us were so physically exhausted (the high temperatures did not help of course), that we did not have energy to fly, once we were done working. But it was very productive work, and it is safe to say we can now land on most of the runways, without the risk of getting a wing hooked on a tumbleweed bush. Pancho volunteered his truck to help clear piles of de-rooted tumbleweeds to one location, near the entrance to the field. There are however some piles left on the north end of the western runway (31L), so hopefully the wind will do the job of blowing them away by next weekend. If not, we need to get those out of the way. The other leftovers that still need to be done, are some more tumbleweed de-rooting and cleanup between the runways (31R and 31L, if I may call them so), and on the west side of 31L, as well as some more work down runway 7. Anyone who could not show up today but want to chip in with this work, are most welcome to continue next weekend. It was nice to see how we were able to continue all the training flights in Orange Crush without any interruption, and in a safe manner, as all workers moved aside every time there was a takeoff or landing. Dan in the tow plane may have missed a heartbeat here and there, seeing us work nearby as he was speeding down the runway, but gladly we were alert, and gave him no reason to worry. Hope to see others join in to finish this project. For those who didn't get out today try coming out next week and help out. Tyler Bishop arrived today with his Dad, Hugh, and continued his flight training. Today was his fifth and sixth training flight and he's doing all of the tow now. That's quite an accomplishment since most who went aloft today agreed that the air was very rough. Tyler handled it all with aplomb. He is progressing quite well and I expect him to solo in the normal amount of time and flights and perhaps even earlier. Tyler is 15 years old and if he continues to his license, he'll join the select group of young people who have achieved their dream of flying here at Avenal. That group includes, among others, Andrea Mersino, Jacob Mersino, Hanna Marlette, Jack Wiegand and others in that age group. Here are a few photos of Tyler taken during the first six training flights at Avenal. This is one of Tyler's early training flights in the Orange Crush. Safely on the ground he accomplished quite a bit including most of the tow. 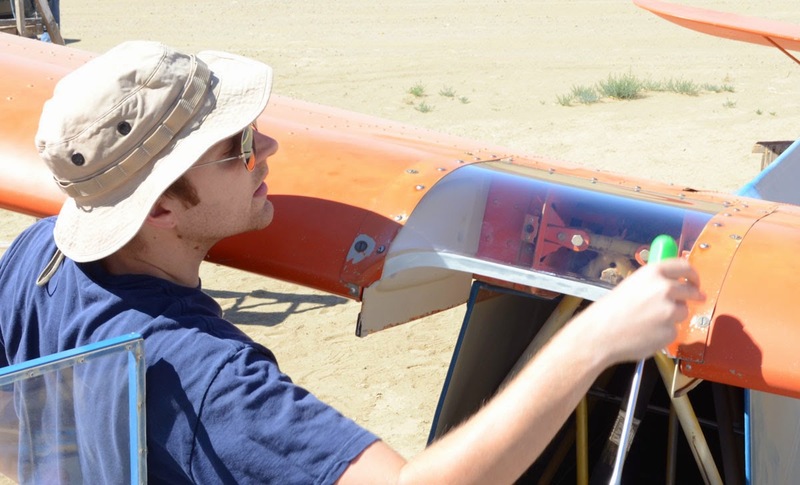 Tyler is preparing for his fifth and sixth training flights on June 28th a rough air day. Searching for lift among the rough air is not an easy learning experience. Tyler did well. Joe Anastasio was one of the few who braved the heat and tumbleweeds, worked hard most of the day but was still energetic enough to assemble his PW-5 and go aloft. He had a good flight, found lots of lift, played up and down the mountain range and Kettleman Hills and came back still with some energy leftover. Joe ready for his flight helped by Craig Gifford, while Tyler Bishop stands by the wing. Also getting in the air after a very hard, hot day of work are Morgan Hall and Carl Engel. I'm sure it was a lot better aloft than what they were doing all day, but Morgan still had to work hard to gain altitude as we watched him circle near the field for some time, gaining slightly but still aloft. Later he did get up higher and into the mountains where he told us the thermals hit a ceiling of about 5000 msl, the reported inversion layer. Morgan and Carl circling the field at about 3000 msl. Still nearby, I couldn't decide which photo was better so I decided to insert both. It was a day of hot, hard work, and some fun later on for just a few. Craig Gifford flew one flight and managed to stay up for awhile. Edo and Alex did several training flights that included boxing the wake in that rough air and later on , Andrea Mersino arrived to fly just once but she reported a fun flight, not very high and in the Orange Crush whose variometer doesn't say much when you want it to. After her flight, and Edo's two flights with Alex, Morgan and Carl landed and the day was complete. Hi, here is a short video showing takeoffs while we were clearing tumbleweeds. Shot & edited on my Lumia Icon phone. Thanks to all who made the day another excellent accomplishment for all our members. Wind: 5-9 MPH most of afternoon, gusts 11-15 MPH. Orange Crush got its Annual Inspection this morning. Jan Zanutto was the Inspector. and he had a good crew helping him. Carl Engel pulls the dive brake handle to actuate the brakes while Jan watches the actuating rods and master cylinder. Carl vacuums while Edo loosens up the encrusted dirt. 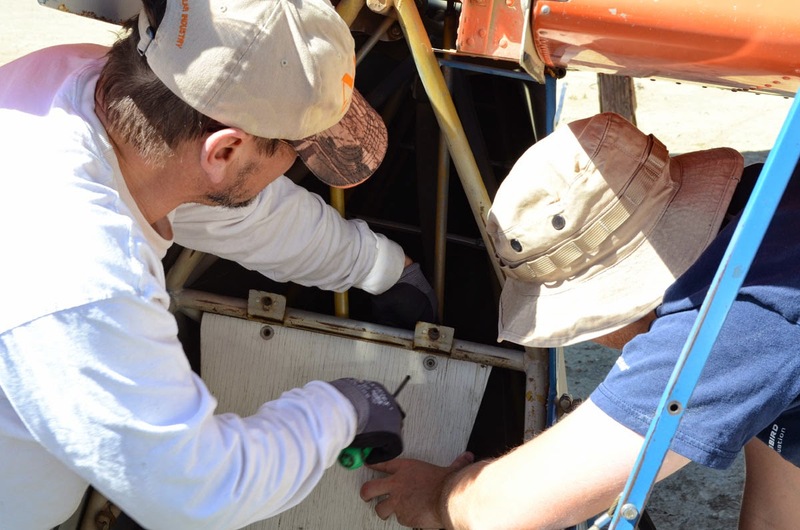 Carl and Alex reinstall the center section cover. Carl is satisfied with the final fit of the cover. Joe and Carl replace the rear seatback and secure it. 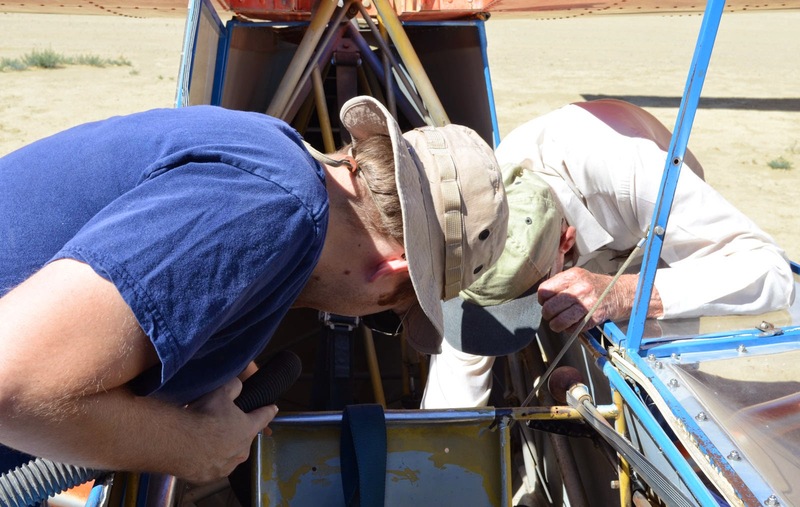 Carl slowly positions the rear headrest while Edo feeds the shoulder straps through the hole. 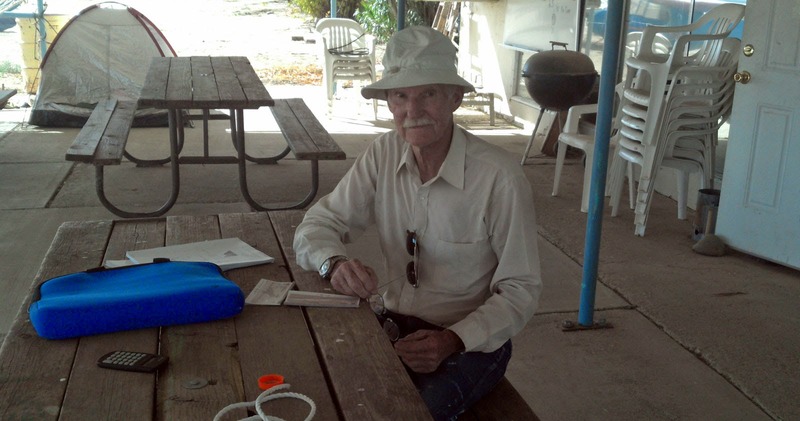 Now, on to the day's flying Allen White has the towplane pilot duties for the day. Morgan is the first glider up today, giving a ride to a lady who won it at a benefit auction. Morgan's passenger waves for the camera as she passes by on takeoff. Carl Engel had a good flight in the 1-26 while I was on a fuel run. I did get back in time to catch his landing. After helping with the Orange Crush annual in the morning, I took up the 1-26, launching just before 1pm. While on tow at 2,600' MSL, we hit a strong thermal over the crop circle so I released and rode it to 4,100'. Morgan recently was coaching a few of us on how to release in thermals and use those to climb vs being dragged up by the tow plane. His insight was perfect, as my flight trace shows my climb rate in that first thermal equaled what I was getting on tow! After running back and forth between the crop circle and the tanks working thermals for a while, I worked my way to the first ridgeline. I found some more lift there, so then I cautiously made my way towards Black Mountain, making sure I had comfortable altitude margin to make the glide back to Avenal (judged by a combination of XCSoar and TLAR). A couple times I had to turn back to stay within glide, but then found good lift to allow me to try again. As I was about to connect with the closest part of the ridge going to Black, I checked the time (3pm), and realized I was supposed to be on the ground about to leave for home for an evening commitment I'd made! I bee-lined back, with plenty of altitude to spare. Flight duration was 2.3 hours and max altitude was 5,200' MSL. I easily could have stayed up longer, and probably catch lift off of Black to get higher as well if I didn't have to leave, not bad at all in the 1-26. My best flight to date, and one that teaches not to make plans where you need to leave mid-afternoon! I've also attached a sreenshot of the GPS trace colored by altitude, which provides some additional insight into the flight. This was created by a 2nd GPS/baro logger device I was using that a couple friends originally made for logging skiing and hiking. Alex gave a demo ride to Frank, who is trying to gauge his interest in getting a glider rating. "I flew 3 flights with Edo McGowan who drove all the way up to Avenal on Friday from Santa Barbara, a drive of 5 hours. Edo spent the night Friday night at the club house." "He spent Friday afternoon painting the segmented circles around our wind sock and wind T. Some of you may not have been out there lately, but the segmented circle is made up of numerous old water heaters painted white!" Water heaters, may you rest in peace--with a fresh coat of paint from Edo. "Edo is doing great in his flying, he is doing the tow completely on his own, as well as the pattern and landings. He has a lot of power time and owned his own aircraft in the past. 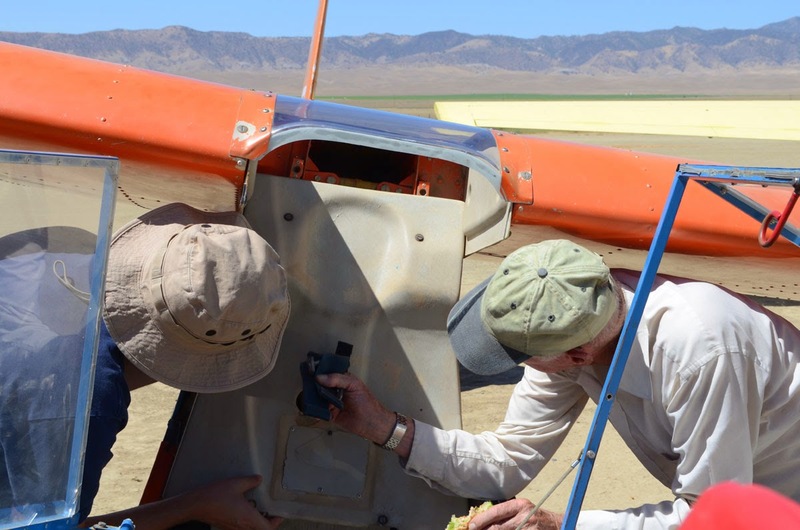 He has also flown gliders at Santa Ynez, and had done some winch launches at Los Alamitos Naval Air Station in Long Beach under a long term CAP glider program they have had there for many years. We did a lot of thermaling and reached a max altitude of 4800ft. MSL." Right wing down to slip into the wind, left rudder to keep from turning. Alex is enjoying the breeze as Edo is on short final. 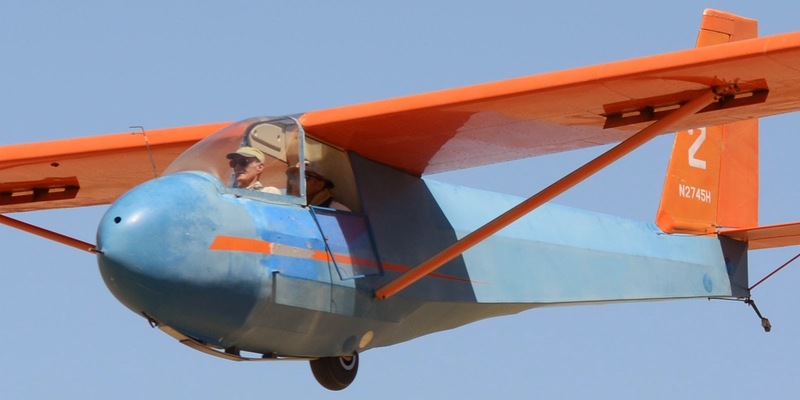 "Craig Gifford flew 2 flights in Big Bird. On his second flight, he reached 6700 ft. MSL, which was the highest altitude anyone achieved out of Avenal today, including Morgan in H5, who got to 6300 MSL. Craig also stayed up for 1.7 hours on that flight which may be also the longest flight of the day, although I'm not sure about that." 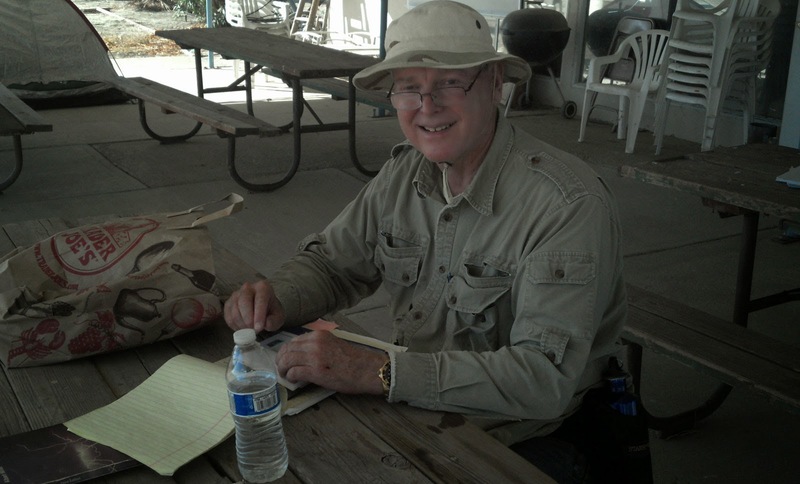 Jim reports: "I lost sight of Craig several times as he had his great flight. On the ground we could see great dust devils, including one near the red barn that was larger at it base than the red barn, and obviously had a lot of strength. After landing Craig started to put Big Bird away, and I asked him how conditions were. He said he had to land because he couldn't find any more lift. I figured there was not much point in me going up, although Alex was still up in Orange Crush doing well. Morgan talked me into it, saying, something like, "at least you'll get some tow practice and accuracy landing practice. Turned out that was what the flight amounted to. I released at 2000' AGL north of the gliderport. Did not find any significant lift, just enough to slow down the descent. Alex was southwest of the gliderport and well above me, so I started heading over in his direction. As I was passing the gliderport Alex was still well above me, and appeared to be climbing. (Best guess is he was just not descending as fast as I was.) 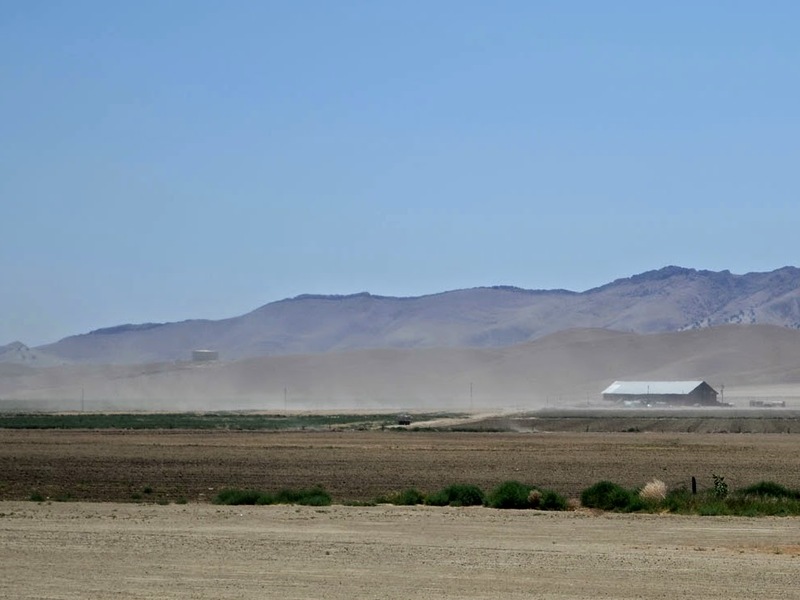 As I was approaching the big red barn, at just a little over 2000' MSL, I decided I was not going any further, as I was not seeing any signs of lift.and had headwinds to get back to the field. I had only about a mile to go to get where Alex was, a thousand feet or more above me, but would have had to depend on finding lift that that I did not have confidence was there. Got to practice that accuracy landing Morgan promised me, and did pretty good. Alex and Edo landed not long after I did, which confirmed that I made the right decision not to chase their lift. 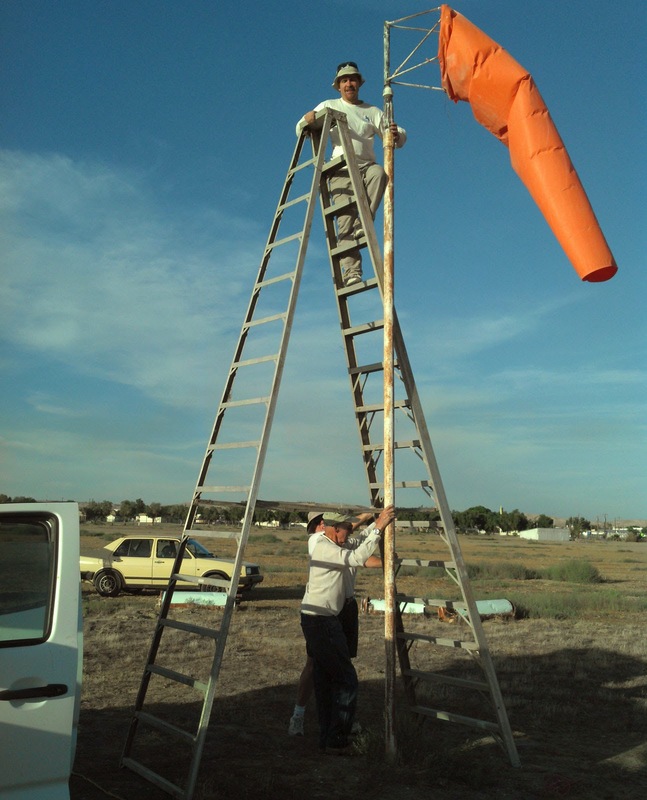 After the flying was done and all the gliders secured, we directed our attention to the windsock. Those of you who have been out in the last month may have noticed it was not performing like it should. Only one of the metal grommets that are used to hold the sock to the ring was still in the fabric, the rest of the metal grommets had torn out of the sock. Alex wrote, "We noticed the wind sock looked kind of floppy today, and discovered it had torn loose from the ring on which it is mounted so it was not able to fill properly with air. A team was dispatched, and a field repair was made. It is now working properly, although it looks like it will need to be replaced at some point in the not too distant future, having been exposed to the brutal Avenal conditions for the last few years. Steve Schery is the one who originally installed our current wind sock. The pole and mounting are a legacy of when Chevron had the field and like many other structures at Avenal airport, appears to be made of old oil field pipe and some rebar recycled in a quite clever way." 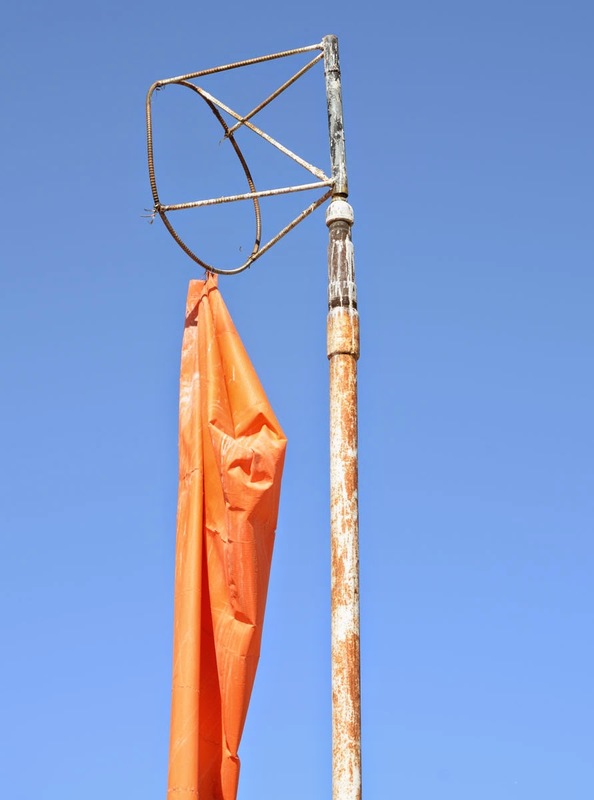 And here is the windsock after repairs. Wind: From the southeast, 5-12 kts, then from the southwest 10-18 kts. The weather early was quite nice with a steady breeze out of the southeast. So, they launched from the northwest end of the runway, taking off on runway 13. 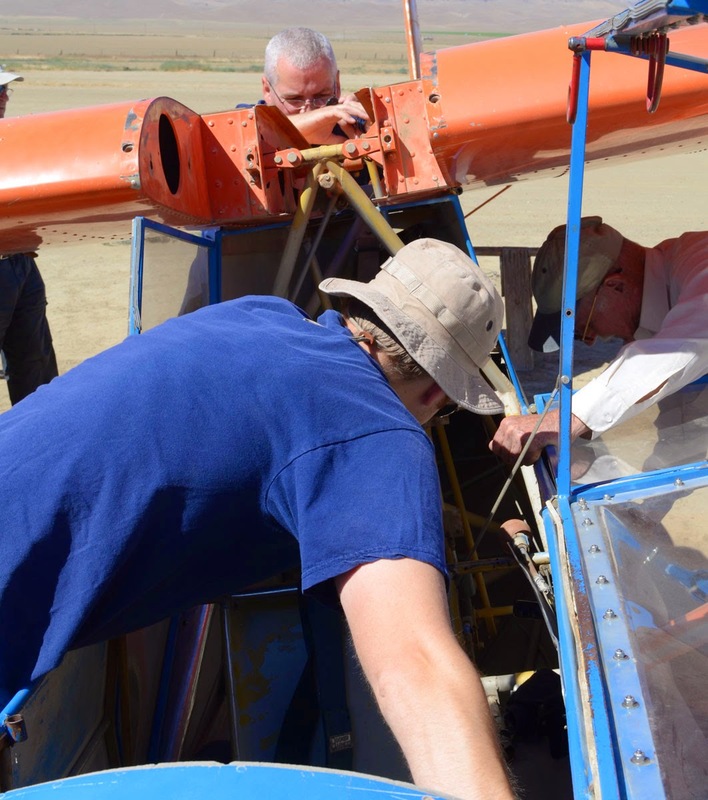 Dan Gudgel and Andrew were through with the oral about 10:00 am and immediately began the preflight inspection with Dan observing. That went well and Big Bird was towed to the northwest end for launching. The first launch was quite good and very close in at 200 agl so Dan opted to release the tow and Andrew did a reverse course and landed half way down the runway and rolled to the launch end. Nicely done. Then the next few launches were according to the Practical Test Standards for the flight portion and again, Andrew did well in spite of his last landing in the face of a very strong direct crosswind since the wind had shifted while they were aloft. It took all he could to keep the glider aligned with the runway and wing down against the wind. After a short rollout the test came to a positive conclusion. Andrew had passed his checkride. CONGRATULATIONS, ANDREW. Dan Gudgel observing Andrew Ouellet doing his preflight on Big Bird. Waiting at the northwest end. Just like a painting by Renoir. Launching on his first checkride flight that turned out to be a sim rope break. Returning from 200 agl south of the runway, landing to the northwest. Peter Mersino over the fence at 200 agl then diving down for a landing. On tow for another flight heading southeast. Both Dan and Andrew concentrating on the tow as they pass the clubhouse. Performing maneuvers above 3000 msl in a clear sky. Another painting by Renoir just as they ready for the final launch. Rolling out to a successful finish for Andrew's checkride. All four crew members involved in Andrew's checkride. Andrew Ouellet congratulated by his Flight Instructor, Harold Gallagher. First of all, my flight got off to a good start because I was able to congratulate Andrew on passing his checkride! When the e-mail came the night before, I thought, "Well, that is kind of early." But Bart's Avenal RASP predicted things would be pretty good early, with the BL Max being right over Avenal at 10:00 AM, and the best thermals about 1:00 PM. So I took the invite to come and fly, since it had been a few weeks from my last glider flight. On tow it was apparent there was lift, up to about 2700 MSL. Then the ride smoothed out a lot--not a good sign. Climb rate went way down, and I was wondering if there was any point in going to the recommended 3000' AGL. I happened to catch the vario out of the corner of my eye, and at about 3000' MSL we were descending, for what seemed like a long time. On tow. Clawed our way up to 3000' AGL and released. As I expected, no lift, but it did give me some time to go hunting. Searched for that "Positive BL Max" over the town, or maybe a little bit of upslope wind over the hills to the northeast. Found a little lift just past the north edge of town about the time I was down to 2500' MSL. And more lift. And more. I knew that I was downwind of the gliderport, and I knew there was sink, so I kept my TLAR (That Looks About Right) Angle pretty high. Lift was slowly moving to the NNE, just like the RASP had shown it would. About 2 miles north of the town I was able to stay in some good lift, briefly up to 8 knots, long enough to touch 4000'. All the time keeping and eye on my "TLAR Angle." After I touched 4000' I could not find any more lift. In fact, quiet the opposite, so I started heading to the gliderport. Coming out of my last turn, the gliderport was in the very bottom left hand corner of the canopy. As I increased the airspeed into the wind, the runway threshold started descending even more on the Plexiglas. Good! Crossed the runway 13 threshold at about 2600' MSL, so I still had a little time to play. A few seconds later it started getting bumpy, so I started hunting. Was able to stay between 2500' to 2900' for quite a while, all the time staying very close to home. The really good updrafts seemed to be a really small diameter, there were a couple of times the updraft was succeeding in rolling me out of the turn despite full aileron into the turn. Kept getting harder and harder to find the updrafts, until finally it was time to give it up and land. With the wind I stayed high in the pattern--altitude is my friend! On very high final I set up my slip. Full rudder wasn't enough, so add some crab in there, too. As I got closer to the ground, the crosswind component decreased enough to get rid of the crab. Touched down where I wanted to, and thought I was going to stop within PTS standards. Not so--as I slowed down, full left rudder became inadequate to stop the weathervaning to the right, so without any nose-wheel (or tail-wheel) steering nor differential braking to use, I pulled the brakes and ended the ground roll. The fun came when it was time to put Big Bird away. Peter brought the golf cart out and hooked on. 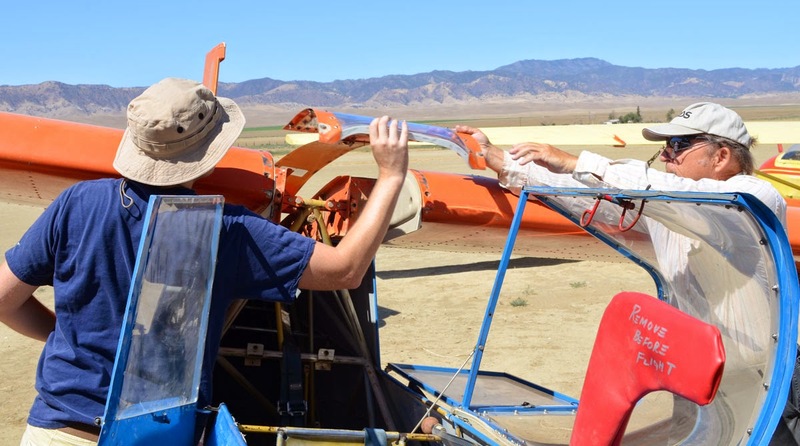 I went to the right tie-down ring to pull the wing down, but so close to the fuselage even a big guy like me was not going to have much reserve pull the wing down against the wind. Peter got out of the golf cart and went to the left wingtip and pulled it up, so I could reach the right wingtip. I walked the right (upwind) wingtip as Peter drove the cart, but it didn't work. As the wind weathervaned the glider, I sped up. Faster and faster. The wind was helping the speed, like the fuselage was a sail. I ended up lowered the right wing so the left wing would go over the golf cart! (In retrospect, if had been walking the left, downwind, wing, I could have held it back to counteract the weathervaning, vs. pushing the right forward to counteract weathervaning.) Peter decided it was time to get the golf cart out of the way, and he, Avenal's newest Glider Pilot, and myself walked it in by hand. Today was the first time I have worked the convergence. The most crosswind I have landed a glider in. Stayed up about an hour. A great flight! At 12:30, as I was heading to the car to head home, I saw blowing dust to the southwest through west. It only had horizontal movement, no sign at all of any lifting. It visualized what I had already figured out, thermals around Avenal were done for the day. Everybody was happy at the gliderport today--once again, congratulations Andrew! The blowing dust nearly blew all of us away just after noon. A very nice day for Andrew, he did well on all portions of the test, and deserved the add-on license to his power rating. And thanks to Peter Mersino who came out to Avenal specifically to tow for the checkride. John Harbick whose own checkride the day before came to an abrupt end for lack of validating paperwork by the FAA, came out today for the very same reason; moral support for Andrew and helping launch each flight. Thanks John.